Certain places are synonymous to certain things or activities to the extent that visitors turn a blind eye beyond them. Like how house boats are to Alapuzha, tea gardens are to Munnar, Taj Mahal is to Agra; beaches are synonymous to Goa. However, Goa has much more to offer for both tourists and travellers beyond its renowned beaches. Be it adventure, historical or spiritual attractions, all these cater to the needs of the discerning traveler who would like to see Goa, sans the beaches. Away from the crowded Northern Goa and its serene southern part, the centrally located Panjim is an ideal base to explore the less trodden trails of the state. Located in the heart of Panjim, Fontainhas is home to a platter of colourful buildings built in Portuguese architecture. When plague hit Goa in the 18th century most of the people fled Old Goa and settled in Fontainhas. Fontainhas gets its name from a fountain located here which is believed to have been the only source of portable water during those days. The houses here belonged to the Portuguese officers and administrators. However, many have now been converted into home stays and inns. The impressive part about these colourful houses is that they are painted every year after the monsoon. Apparently there is an association of residents who make sure they are well kept and maintained. It is a delight to walk through this neighbourhood gazing at the intricate works of the window railings, closed colourful doors and the quaint lanes which tell a hundred stories. Confectionary January 31st is an eighty year old place hidden in one of the by lanes of Fontainhas that offers delicious plum cakes and Swiss rolls to its guests. The churches of Velha Goa or Old Goa are probably as popular its beaches. Though this town was built by the Bijapur Sultans in the 15th century, this UNESCO world heritage site gained prominence when the Portuguese evangelized it between the 16th and 18th century. The magnificent cathedrals, churches and convents are reminiscence of the Portuguese rule for over two hundred years in Velha Goa. Basilica De Bom Jesus is undoubtedly the most exquisite structure here with its baroque architecture and imposing façade. The magnificent art work, ornamented pillars and the numerous altars are a mark of beautiful craftsmanship. It also houses the mortal remains of St. Francis Xavier. Across the street, Se Cathedral of Santa Catarina stands tall bathed in white. Built in typical Portuguese architecture, this cathedral was once considered the largest in Asia and has many altars and paintings. Church of St. Francis of Assisi is known for its barque style architecture and breathtakingly beautiful wall paintings from the 17th century. Built in Corinthian architecture, Church of St. Catejan has a beautiful external façade and houses one of the most magnificent altars in Goa. The other popular monuments in Velha Goa are Chapel of St.Catherine, Tower of St. Agustine church, Convent of Santa Monica and Church of Our Lady of Rosary. The isolated Church of the Lady of Mount located on a hilltop offers excellent views of Velha Goa. Across river Ribander which is a part of Mandovi, lies the island of Divar. A cycle tour is an ideal way to explore this peaceful island. Ride along Ribander and then take a ferry to Divar. Open fields, mangroves and various species of birds welcome you here. The island is absolutely serene, laid back and has colourful houses along with pretty churches. Made up of three small villages- Malar, Piedade and Goathias, Divar is a far cry from the maddening crowd of Goa. Chorao is another beautiful island which is a ferry away from Divar. Lined with more lovely houses and roads cutting across fields, Chorao is well known for Salim Ali bird sanctuary located at its one end. From Chorao one can again board another ferry back to the mainland. Cycling around these lovely river islands opens up another part of Goa, so unknown to the touristy crowd. Adventure Breaks offers guided cycle tours through these lovely islands. They also provide cycles and gears, apart from some nice Goan breakfast. Bambolim beach, a short ride away from Panjim town has timid tides and is ideal for kayaking. Early in the morning head to this black sandy beach and kayak your way through the calm waters, past the rocky out crops and chase fishes jumping out of the water. The cool weather in the morning and the endless sea is apt to explore this sport. You can kayak all the way up to the nearest Siridao beach and then return. 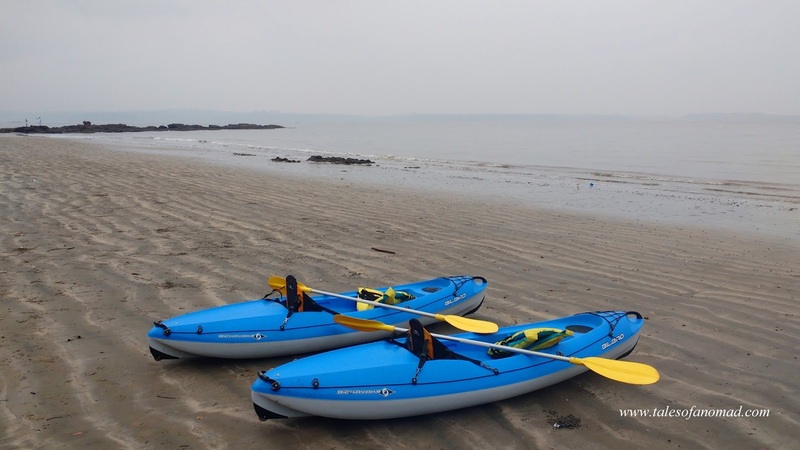 Adventure Breaks offers kayaking at Bambolim beach and all the gears would be provided by them. The mangroves of Divar island are a delight for bird lovers. Take a ferry ride to the island and go on a walking tour with Wild Otters who occasionally conduct tours in these mangroves apart from conservation and research on otters. The walk will give you an insight about the mangroves and the life of otters found in these marshy areas apart from the sighting of numerous birds. Sunset over the Mandovi river is a pleasant one. Go into the hinterlands of Goa, and its villages will welcome you with vast cashew farms, the aroma of which wafts around as soon as you enter them. There are many spice plantations like NV Eco farm which provide walking tours through their spread out farms. With cashew, mango and a host of other fruits apart from the various varieties of spices, a walk through these large acres of greenery is a throwback to the backyard of your grandmother’s home. During season (March- May), one can also understand the preparations of feni making. End the tour with a lunch spread of the best Goan preparations. These farms are more than an hour's drive from Panjim. Though the churches of Goa have been ever popular, temples such as Shantadurga and Mangueshi too have been prominent over the years. However, the most attractive of all the temples in Goa is Mahadev temple at Tambdi Surla. Built in 12th century during the Kadamba dynasty, this is the oldest temple in Goa. Located in Bhagwan Mahaveer sanctuary, the temple has a neatly maintained garden and is adorned with beautiful carvings on its walls and pillars. The temple is 68 Kms from Panjim. To the south of Miramir beach in Panjim lies the small hillock of Dona Paula. Climb the short flight of stairs to enjoy the gorgeous vistas that Dona Paula offers. The sunset view from here is probably the best in Panjim. Silhouettes of port, harbour and ships form a beautiful frame as the sun sets and the background lights up slowly. 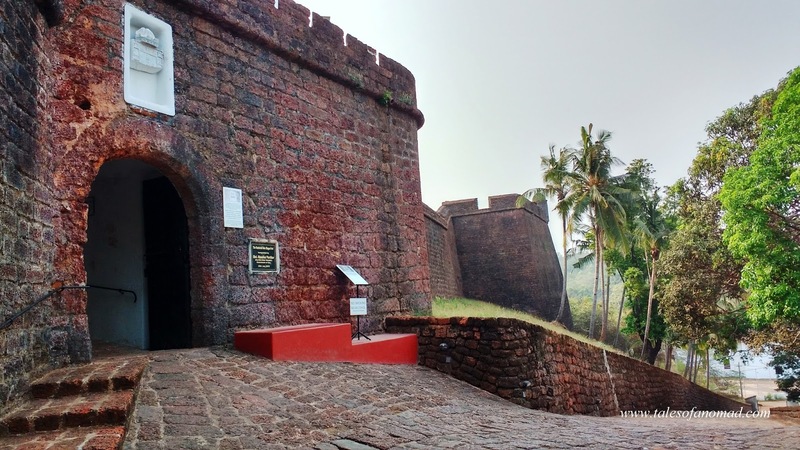 Located at the mouth of Mandovi river and overlooking the Kegdole beach lies Reis Magos fort, steeped in history. This 15th century structure with its tall laterite walls, bastions and canons is the oldest fort in Goa. It has undergone renovations over the years and is well maintained presently by the authorities. The bastions offer lovely views of the Arabian sea and Kegdole beach. The fort also houses numerous old paintings and photographs from the bygone era. Reis Magos church is another popular attraction here. Though most of Cabo de Rama fort is in a dilapidated state, the vistas that the ramparts of this fort offer are breathtaking. Climb up the bastions to enjoy the panoramic views of the Arabian sea. 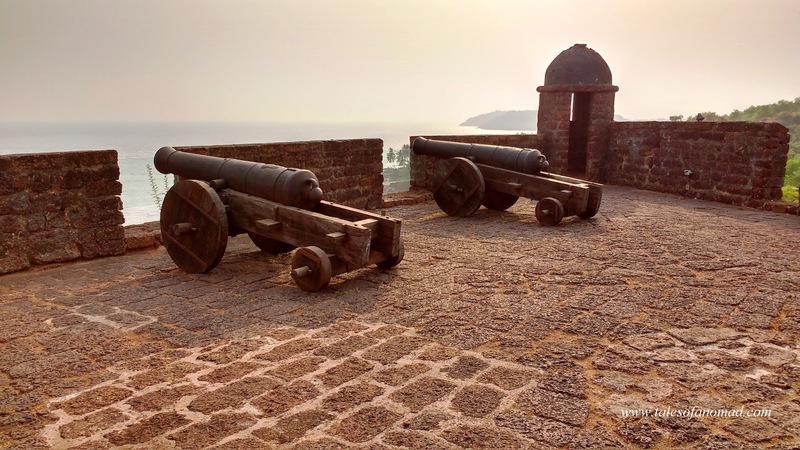 Built by the local king and taken over by the Portuguese in 18th century, the fort layout is difficult to discern, but it definitely is a huge one and visitors can stroll around its ruins. Chorla ghats connect Goa with Belgaum and a ride through this meandering stretch is a sheer delight with flower laden roads, lovely canopy and beautiful views throughout. As you ride up, the aerial view of Anjunem dam amidst the thick forest patches open up. A ride during the monsoon would be a memorable one. Aldona is a quaint sleepy village by the bank of Mapusa river and is known for its charming landscape. Claimed by many as one of the most beautiful village in Goa, Aldona’s major attraction is its St. Thomas or Sao Tome church. The stunning edifice has beautiful frescoes inside and its cemetery is the most attractive one you are likely to see in Goa. A cable bridge connects Aldona with Corjuem, which is known for Corjuem fort. Chandor or Chandrapura as it was earlier known was a popular port and the capital of the local rulers in the 3rd and 4th centuries. Go past the vast paddy fields, and the road to Chandor is lined with pretty colourful houses built in Portuguese architecture. The most popular amongst them is Menezes Braganza Pereira house. Believed to be more than 400 years old, this heritage home with its colourful glass windows, beautiful door frames, hanging old paintings, a plethora of antiques and artifacts, age old wooden furnishings, magnificent chandeliers and colourful tiles, is a delight to walk through. The impressive part is that most of these displays and furnishings have been imported years ago, and they are still in mint condition. 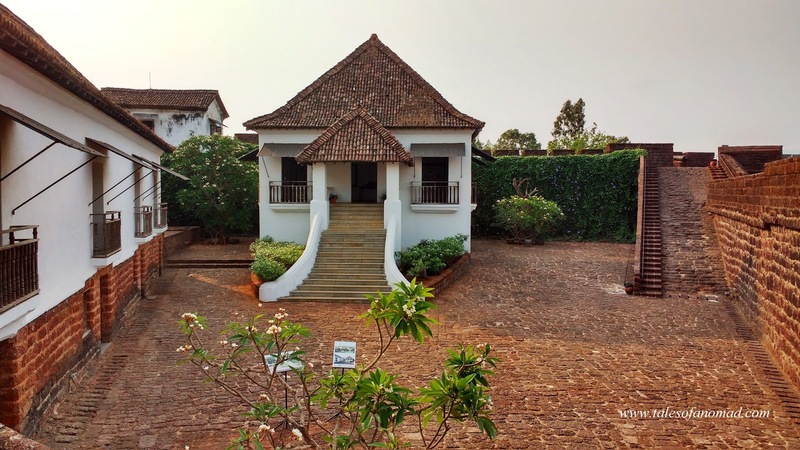 74 year old Mrs. Braganza, who is the 14th generation descendent, presently lives here and would be glad to take you on a tour of this magnificent house. Fernandes house is another popular house in Chandor. Chandor is 42 Kms from Panjim. Built in early 17th century and located at the mouth of Mandovi river, Aguada fort is probably the most beautiful fort in Goa. The huge fort with its spread out ramparts was used to store fresh water apart from acting as a guard against the Dutch and the Marathas during the rule of Portuguese. Apart from numerous bastions and a small chapel, the fort also houses a 19th century lighthouse. The views from the fort walls are spectacular. Our Lady of Immaculate conception is probably the most popular church in Panjim. With its long flight of steps, the whitewashed church is a gorgeous structure in the middle of the city. However, visit the church after dusk when it is lit up and looks most beautiful. Against the darkness of the night, the glowing church forms a beautiful frame, a delight for every photographer. Thank you, Prasad. Lots to explore in Goa. Nice compilation. Goa has lot offer apart from the beaches. True that. Shall go through your post. Yeah, the other part of Goa is equally colourful. Ghat section, Mangroves and beautiful houses? Nice!! Yeah, Goa has loads to offer. You have missed out the real off beat one, the ones quoted are still on the tourist itinerary, We have a customs Museum at Panaji, we have the Portuguese consulate art gallery in Fontinhas, the Brahma temple at Opa, the Mohini temple at Verna, the Museum of houses at Torda, the Mario Miranda museum again at Torda, the ancestral goa/big foot at Loutlim, The Datta Mandir at Sankli. That is a nice long list. Thank you for that. The list I made does not convey that it is an off-beat one. It is a list of places I have been to apart from the beaches in Goa, and which others too can explore. Sorry I missed out on the butterfly farm. Some of them seems totally unexplored. Wonderful compilation! Thank you, glad to hear that. Hope you see Goa from a different perspective next time. All the place was very nice. Thanks for sharing beautiful place. Such amazing pictures and great post, loved the Churches. Thank you, Ram and Reshma.